In just 2 weeks I’ll be having my annual online celebration of Izannah Walker’s birthday. This is an extra-special year because it marks the 200th anniversary of the day she was born, September 25th, 1817. I’ll be posting off and on all day on the 25th at www.izannahwalker.com. There will be some new dolls available for sale that day, which will be posted at noon eastern time. Come visit the blog, join in the virtual party and celebrate with us! Izannah Walker Birthday Greetings Project. As a fun way to celebrate Izannah Walker’s birthday I would like to invite you all to email me a short birthday message along with a photograph of your Izannah Walker doll, whether it is an antique original, a reproduction doll that I have made for you, or a doll that you have made yourself in tribute to Izannah’s dolls! Please send your photo and birthday greeting to paula@asweetremembrance.com no later than September 18th. I will post all of the photos and their accompanying messages on http://www.izannahwalker.com as part of my annual Izannah Walker birthday celebration. Everyone who sends in a birthday greeting will be entered in a drawing to win a special birthday surprise package!!! 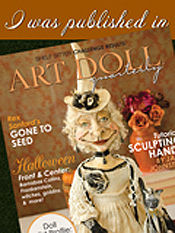 You may already know that I wrote a twelve page article about Izannah Walker for the September issue of Antique Doll Collector. The issue has sold out. 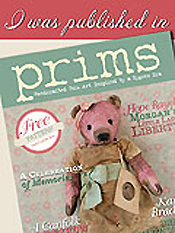 The magazine has no more copies, and will not be printing any more. If you are looking for a copy, try Barnes & Nobel. Many of their stores still had some this past week, although in very limited quantities. Another thing that you might be aware of is that I am the co-chairman for my doll club’s annual doll show, which is coming up on October 29th in Southbury, CT. This is the 30th year for the show, so in honor of both the club’s 30th show and Izannah Walker’s 200th birthday, I am curating a special educational exhibit of Izannah Walker dolls at the show. Admission to the exhibit is included with your paid entrance ($7) to the show. It is going to be a wonderful show and a fantastic exhibit, with a very large group of antique Izannah Walker dolls belonging to Jenny Lind Doll Club members and friends! To find out more about the show visit the show blog https://jennylinddollshow.wordpress.com/ and the show facebook page www.facebook.com/jennylinddollshow/ you can get discount admission coupons there too. If you are interested in selling at the show, I do still have a little space left!!! Email me ASAP at jennylinddollshow@gmail.com for a contract!!! In case you missed them, my new Third Thursdays are going strong! Because of Izannah Walker’s birthday celebration there is no “3rd Thursday” in September. There isn’t going to be one in October either, because any dolls I get finished in October will be going to the doll show with me. I want to have some there at the exhibit for people to hold and examine up close. Obviously all of the antique Izannah Walker dolls will be roped off, but I would like to make the exhibit a bit interactive, so I will have some of my reproduction dolls on hand for those who would like to give them a gentle hug and get a good sense of their size and weight. For more information on 3rd Thursday’s click on this link: https://izannahwalker.com/2017/07/15/third-thursdays-start-this-month-mark-your-calendar-then-come-back-on-thursday-to-see-this-months-new-dolls-for-sale/ . 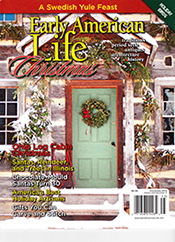 I have a new article in the upcoming Christmas issue of Early American Life magazine. It is a project article on how to make cotton batting candy containers. 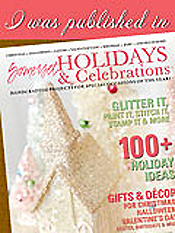 Also included in the Christmas issue is the Holiday Directory of Traditional American Craftsmen. I’m very honored to have been included in the Holiday Directory again this year. To see a bit more about my candy container article click here: https://spuncottonornaments.wordpress.com/2017/09/10/look-for-me-in-the-christmas-2017-issue-of-early-american-life/ . 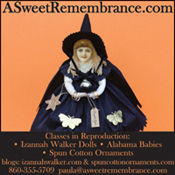 The class support sites for both my Izannah Walker Reproduction Doll Making Class and my Spun Cotton Ornament Class have moved to private facebook pages. No one has been using the Ning sites, so I have switched over to facebook. Both Ning sites are still available at this time, so please go save whatever information you would like to keep from the Ning sites. I will NOT be moving all of the previously posted information over to facebook. We are starting out fresh! The spun cotton ornament how-to videos are posted on the facebook site. If you are already a member of either class and would like to come join us on facebook, please email me at paula@asweetremembrance.com and tell me the email address that you use for your facebook account. I will then check to make sure you are a class member, and send you an invitation to the class page. At this time I have NOT moved the Alabama Baby Class over to facebook, it is still only on Ning. Look for my article on how to make these cotton batting candy containers in the 2017 Christmas issue of Early American Life. 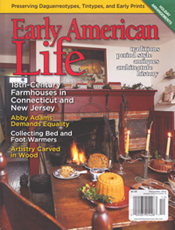 It won’t be long now until the 2017 Christmas issue of Early American Life, with my article on how to make cotton batting candy containers and the Holiday Craftsman Directory, is out! I just received my advance copies and it is a fun issue!!! There are several other projects, besides mine, plus recipes and Christmas themed articles to put you in a holiday mood. I don’t do as many how-to articles as I once did… so it was a bit nostalgic to visit my past and design a new project for my article. I made two versions of two different candy containers, which means there are lots of options for people to try. 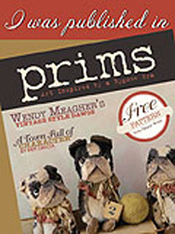 P. Walton chosen for the EAL Directory of Traditional American Craftsman 38 time. Heads up Spun Cotton Class Members! I have started a private facebook group for my spun cotton students. (Sorry this group would only be open to class members who have purchased my spun cotton ornament class by mail.) I sent out a group email message and also posted this information on the Ning class site. No one has been using the Ning site recently so we have moved… Please save any information you want to keep from spuncottonornaments.ning.com . Wishing you great joy this Christmas season!! !